This article was originally posted on the Fierce Mamas blog in April 2010 — years before I decided to become a birth worker. Five years later, the U.S. maternal mortality rate continues to rise. Recent reports also show that, in the U.S.,3 rates of both labor induction and c-section are TWICE the World Health Organization’s recommendations.2 As we are seeing, these medical interventions (while common) are not without risk. The current mainstream birth culture in the U.S. is simply appalling. Pregnancy and birth are treated as a disease and acute trauma-waiting-to-happen. Many women are not given complete information about the birth process. More and more cases are being reported of maternity patients being coerced into submission; their basic human rights are ignored or even revoked through the courts. Astonishingly, this behavior is not limited to maternal care providers for disadvantaged, low-income or uneducated women. Time and time again, I’ve seen high-powered, confident, educated women become completely submissive. They forgo asking questions and just trust their doctors to make decisions for them, and then accept whatever course of treatment may result. In low risk situations, intervention can, in fact, actually impede the birthing process and create those life or death situations that doctors claim to be trying to avoid. Despite their lengthy and expensive educations, far too many U.S. care providers have little or NO experience in observing a normal, natural birth. Therefore, they have no idea what a normal birth looks like, much less what a woman in that situation may need. In contrast to the rest of the world, almost all pregnant women in the U.S. choose to receive their care from an OB and give birth in a hospital. When it’s truly needed, medical intervention can, of course, mean the difference between life and death. But women’s bodies are designed to give birth — without any interference! It’s only been in the past 100 years13, that birth was appropriated from women and transformed into a paternalistic, medical, mechanized event.14 As such, women lost the knowledge that comes from witnessing and assisting their mothers and sisters give birth. And women lost faith in their bodies’ innate abilities. Today’s mother-to-be has probably heard more birth-related horror stories than she can count. From the time she was a young girl, she may have heard her mother, her aunts, and even her friends discuss childbirth as a painful, frightening injury. Unfortunately, these misconceptions are perpetuated and reinforced through popular culture of television and movies. In reality, a normal birth wouldn’t bring in big ratings or box-office dollars. In some parts of the country, it’s extremely difficult to find a provider willing to intervene ONLY when truly medically necessary — especially if the woman has had a previous c-section. Fewer and fewer facilities are willing to accept VBAC (Vaginal Birth After Cesarean) patients. After years of increased c-sections, most hospitals have reconfigured their maternity units to accommodate more surgical deliveries: more services scheduled during weekday hours, and more postpartum beds – needed for the longer stays required after c-sections. These changes required costly capital investments. Now administrators need to see a return on those investments. So it’s not surprising that hospital policies reflect the facility’s increased dependence on the revenue generated by c-sections. After all, a c-section brings in TWICE the revenue of a vaginal birth.4 A surgical birth is also easier on the doctor. It takes less time and is much more predictable than a normal labor and delivery. For years, the medical establishment has been working to limit birthing options. They’ve fought against birthing centers, homebirth, midwives, even against their own accountability. Rather than abolishing choices, vilifying alternatives and criminalizing their competition, I’d prefer to see them working for other, more worthy goals – such as educating their patients, encouraging normal/natural births and working with facilities to update protocols to reflect evidence-based medicine, all of which will ultimately reduce maternal mortality. Until then, it’s up to us to change the birth culture! Examine your pre-conceived ideas on birth. How were these formed? From stories of women of previous generations? From fictional or sensationalized movies and tv shows? YouTube is awash with amazing, joyous videos of women experiencing normal, natural births. Use these to visualize the kind of birth YOU want. Take responsibility for your own education on birth! While pregnant, you have months to prepare and can seek out accurate, complete information. Labor is a time of extreme, internal focus. It would be difficult to absorb and comprehend a significant amount of new information. So preparation is key, in case you need to make decisions quickly. Research common interventions such as: ultrasounds, fetal monitoring, induction of labor, epidurals, extractions and c-sections. Learn the risks and what factors determine when each may truly become necessary. Insist that your provider obtain informed consent for each procedure. Read books on natural birthing options. Consider alternatives to the standard OB-attended hospital birth. Choosing a high-tech OB at a high-tech hospital doesn’t guarantee you a safe birth. But it WILL increase your risk for high-tech interventions which may or may not be medically necessary.16 Certified Nurse Midwives (CNMs) are licensed in all 50 states and can attend births in hospitals, birth centers or even your home. Don’t be afraid to make an unusual choice when it comes to what’s best for you and your baby! Don’t choose your provider or facility simply based on location or insurance coverage. Seek out like-minded mothers and local doulas and get their recommendations. Schedule a consultation with potential providers before committing to one. Get their rates of various interventions – fetal monitoring, inductions, episiotomies, forceps delivery, vacuum extraction and c-sections. Ask how much freedom you’ll have during labor – particularly on movement, eating/drinking and positioning for birth. Are there limitations on who is allowed to attend your birth? If they’re anything less than forthcoming with these answers, find another provider. Tour the facility. Ask questions there as well, specifically regarding their procedures for newborn care, policies on rooming-in and breastfeeding support. Listen to your instincts. More women are educating themselves and seeking providers based on their shared philosophies of birth. Unfortunately, medical professionals can also offer the all too familiar “bait-and-switch.” The provider will agree with everything the mother-to-be wants for her birth throughout her pregnancy, but has NO intention of letting the birth happen on those terms. Shockingly, some will even go out of their way to make SURE it doesn’t, regardless of what’s in the best interest of the mother and her baby. So if you have any reservations about your provider or facility, especially if you feel they are patronizing you, don’t be afraid to make a change – no matter how far along you are. Surround yourself with others who have had intervention-free births. Listen to their stories. Ignore those who tell you that you won’t be able to handle it. Take a childbirth class, preferably one OUTSIDE of a hospital setting. (Too often, classes hosted by the hospital are more about “How to Be a Good Patient.”) Bradley and Hypnobirthing are excellent choices. Choose your labor support team wisely. While your partner, family members and friends may want to be present at the birth, consider hiring a doula. She can provide physical and emotional support throughout your pregnancy, birth and post-partum period. She is knowledgeable about the process of birth, familiar with area providers and facilities and can facilitate communication with staff to help you make informed decisions. A woman in labor is vulnerable – both physically and emotionally. A doula can help protect your space and your choices. Empower yourself to have the birth YOU desire! Birth is a business. As more mothers demand normal, natural births, providers and facilities will be forced to adapt to attract consumers. Reducing unnecessary interventions will lead to healthier mothers and babies! 10 National Center for Health Statistics. 2006. 2003 Natality Data Set. SETS 2.0, Rev. 805. Vital and Health Statistics. CD-ROM Series 21, Number 17, May. 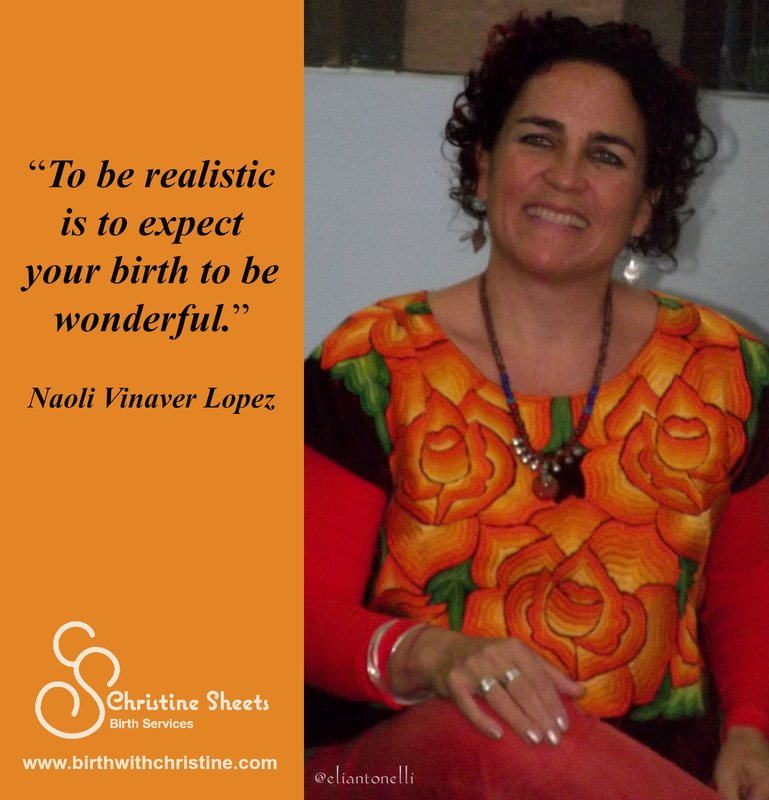 I was a brand new doula when I first heard Naoli Vinaver Lopez’s words. A wonderful birth. What makes a birth wonderful? “Healthy mom and healthy baby” is the catch phrase casually tossed around many L&D rooms. Yes, this should always be the most important goal. (Do we really even need to say that?!) But it certainly shouldn’t be the only concern. With such long-reaching consequences, I truly believe it is the right of every woman, child and family to have a wonderful birth experience. “Wonderful” is a very individual concept. Every person has their own idea of what a wonderful birth looks like. From a surgical birth with general anesthesia, to an unassisted birth in the great outdoors, and everything in between. Each birthing woman will have her own idea of “a wonderful birth.” As will her partner. As a childbirth educator, I help families discover their options and learn tools to help them prepare for and achieve their intended goals. As a doula, I provide support for their choices, mental reassurance, emotional encouragement and physical comfort measures. And as a birth photographer, I try to capture the love, anticipation, effort and exhilaration of everyone involved. But what happens when plans go awry? Just like life, birth is unpredictable. Complications can develop slowly over weeks of pregnancy. Or labor can shift dramatically within moments. All the preparation and practice can’t guarantee a predictable result. Nor can any provider or doula. But while it may not be the birth anyone envisioned, it can still be a wonderful birth. Was she treated with compassion and respect? Where her plans and requests given due consideration? Where the complications and interventions explained fully? Barring an emergency situation, was she given time to process the change in plans and accept her new circumstances? In addition to “healthy mom and healthy baby,” THESE are the goals medical care providers and birth workers should be striving to meet. Because everyone deserves a wonderful birth.